By Abraham Ayuen, Senior Communications Specialist for SIAPS South Sudan. This post originally appeared on MSH’s website. 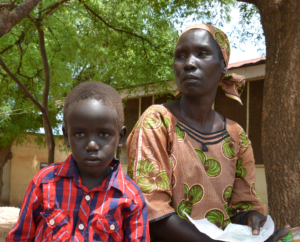 Six-year-old Yohana Peter clutched a bottle of mango juice as he waited for his medication outside a pharmacy at Al Sabah Children’s Hospital in Juba, South Sudan. Seated next to his mother on a metal bench, Yohana looked anxious. “He had fever and stomach pain. I gave him some medicines at home, but his condition continued to worsen, so I brought him to the hospital to be seen by a doctor,” said Asunta Wasuk, Yohana’s mother. Yohana’s family lives in Kondokoro village in Juba County, South Sudan. In this village, access to basic services such as medical care and education is limited. Although Yohana is enrolled in a nursery school in the village, his elder sibling walks approximately 11 kilometers to Juba each day to go to school. On April 11, 2016, Yohana’s mother brought him to Al Sabah Children’s Hospital to see a doctor. After consulting with the doctor, Yohana was diagnosed with malaria. He was given a three-day course of artemisinin-based combination therapy, the first-line treatment for uncomplicated malaria in South Sudan. Wasuk said she is glad that her son was able to receive malaria treatment at no cost at the hospital. She usually buys and keeps a limited assortment of essential drugs, such as paracetamol, metronidazole, and antimalarials/artemisinin-based combination therapy, to treat her children when they feel sick. “Our home is far away from the clinic; I have to keep some medicines at home to treat my children when they get sick at night,” said Wasuk. Malaria remains endemic in South Sudan, accounting for approximately 40 percent of outpatient consultations, 30 percent of inpatient admissions, and 20 percent of deaths in health facilities. Dr. Felix Ngungura, executive director at Al Sabah Children’s Hospital, said that most patients who seek treatment in the hospital have malaria. Ngungura estimates that the hospital receives between 150 and 200 patients per day, with 40 percent of these being admitted. “Malaria is a serious problem. The majority of those occupying beds in the hospital are malaria patients,” said Ngungura. Al Sabah Children’s Hospital is one of the major health facilities to receive artemisinin-based combination therapy from USAID. In response to the 2015 malaria upsurge in South Sudan, the USAID-funded Systems for Improved Access to Pharmaceutical and Services (SIAPS) Program, implemented by MSH, supplied 635,650 artemisinin-based combination therapy doses to South Sudan; 100,000 of those were sent to health facilities through the central medical stores to boost buffer stocks, as part of the Emergency Medicines Fund’s final consignment. These artemisinin-based combination therapy doses will contribute to saving the lives of the most vulnerable—children and pregnant women with malaria. By mid-April, SIAPS had delivered 51 percent of the 535,650 doses to health facilities in the former Central Equatoria State.